Here is Tom Fellows at eighty-six years old, squinting into the light with a half-smile that betrays a circumspect nature honed by a lifetime driving a cab around London. Tom has seen all that existence has to show and he presents himself to the camera with a diplomatic restraint that could equally be deference or suspicion. Tom is looking out at us and making his own assessment of the situation. 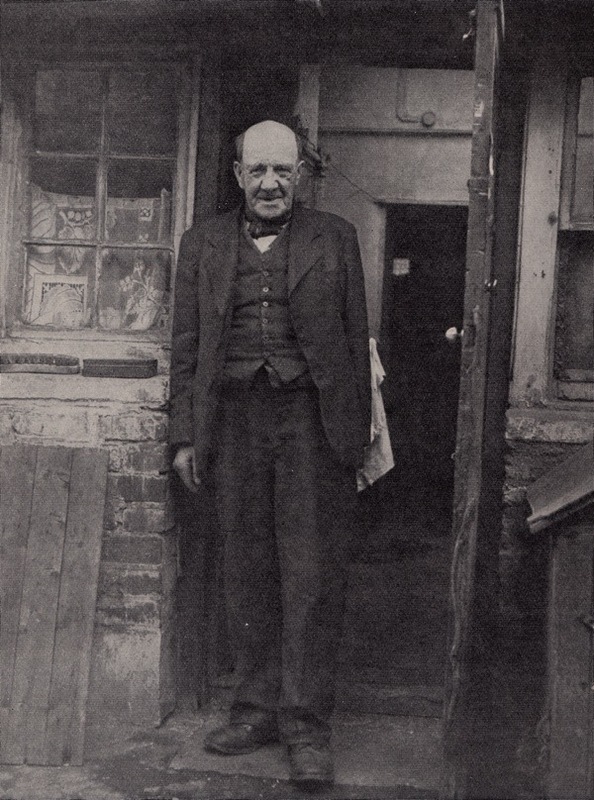 I came upon ‘Old Tom’ in the pages of ‘London People’ by Rev F Howell Everson with photographs by William Whiffin among others, published in 1951 and, although this picture is uncredited, it makes sense that it is by Whiffin, the East End’s pre-eminent photographer of the first half of the twentieth century. Directed to Old Tom’s house near the People’s Palace by a woman with a pram, as being the one with “the little dawg in front,” the Rev knocked but received no response. “Knock ‘ard,” insisted the woman. “I do so – and presently the door opened and there stood Old Tom who, when I had explained my errand, invited me in. It was, to tell you the truth a rather shabby little dwelling, but when you are eighty-six and living by yourself with only a shaggy dog named Mick as your companion, the niceties of domestic life probably lose their importance,” wrote the Rev, already missing his cosy rectory in New Barnet. “Tom Fellows took out a flat tin and rolled a cigarette of Royal Tartan Shag which he lit, and I noticed that his hand was steady,” noted the Rev, relieved that the old codger was not half-cut. “What do you do with yourself nowadays?” ventured the Rev with an empathetic smile. “Old Tom looked out of the window at the high brick wall above which a patch of blue sky could just be seen and shook the ash off his cigarette,” observed the Rev, his thoughts turning towards his Sunday sermon. “There’s not much you can do when you’re my age except wait. Me and Mick, we sort of look after each other, don’t we, Mick?” admitted Old Tom with dignified resignation. “The canine hearthrug promptly sat up and begged, and looked through that curtain of untidy hair at his old master with eyes of melting innocence,” registered the Rev, recognising the work of the Almighty in the agency of the scruffy mutt. The heart of the Rev almost burst with joy at Old Tom’s statement and he knew that this was what he had come to hear. After more than sixty years as a cabby, Old Tom knew instinctively how to find the right words to say to each of his customers – and the Rev J Howell Everson left the East End with his soul gladdened, eager to share this heart-warming experience with the congregation in New Barnet. Another gem. I liked the photo of the tug as well. I am not sure the Methodist minister’s concern about whether Old Tom was half-cut was just the usual Methodist obsession with temperance. Horse cab drivers were a particular target of temperance workers – hence the green cab shelters of which only 13 exist now (and are listed.) They provided food and non alcoholic drinks as a way of luring drivers away from pubs. This approach was also developed to ensure benign (and non drunk!) treatment of the horses. The cabbie was photographed by William Whiffin. I much enjoyed the show of 40 of his prints at Tower Hamlets Local History Library, hard by Queen Mary University in Mile End. 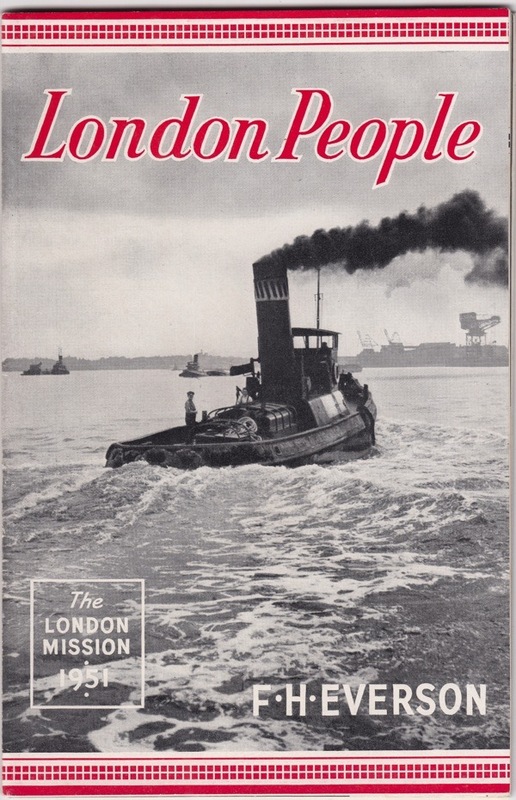 He was a jobbing photographer based in the Commercial Road and active from the 1920s to the 50s. His regular subjects included streets and shop-fronts, markets and fairs, war damage and civil defence, and East End ceremonies, celebrations and demonstrations. The exhibition prompted me to read up about the Poplar rent strike of 1921, and popular local MP George Lansbury. In 1891 Thomas Fellows was a cab driver living at 54 Aston Street, Limehouse. He was aged 23, so this puts the picture at around 1954. The last cab licence for a horse drawn cab in London was issued in 1943 and lasted four years [Trevor May, Gondolas & Growlers]. Either Fellows was working as a cab driver on the Essex side of the river Lea or he was not as old as he was making out which would date the photograph earlier. Just noticed that the book was published in 1951 so either he was in error about how old he was then, or he could have gave a false age on the census in 1891. Surely you are not suggesting Old Tom was embroidering his story for the Rev?